(Nanowerk News) It is possible that broken bones will in the near future be fixed using metallic glass. Materials researchers at ETH Zurich have developed an alloy that could herald a new generation of biodegradable bone implants. Their results have been published in the online edition of Nature Materials ("MgZnCa glasses without clinically observable hydrogen evolution for biodegradable implants"). When bones break, surgeons need screws and metal plates to fix the broken bones in place. These supports are usually made of stainless steel or titanium. Once the bones have healed, the metal parts have to be removed from the body via further surgery. In order to reduce the burden on patients, materials re-searchers have taken up the task of producing implants from bioabsorbable metals. These implants should stabilize the bones only for as long as they need to heal. The metal dissolves in the body over time, rendering removal surgery unnecessary. Implants made of magnesium-based alloys are proving particularly promising. Magnesium is mechanically stable and degrades completely by releasing ions which are tolerated by the body. However, all magnesium alloys have one major drawback: when they dissolve they produce hydrogen (H2), which can be harmful to the body. Around the magnesium implants gas bubbles develop which hinder bone growth and thus the healing process, and potentially cause infection. Materials researchers working with Jörg Löffler, Professor of Metal Physics and Technology at ETH Zurich, have now eliminated these side-effects. They have succeeded in producing an innovative magnesium-zinc-calcium alloy in the form of a metallic glass which is biocompatible and shows significantly more favourable degradation behaviour. Metallic glasses are produced by rapid cooling of the molten material. 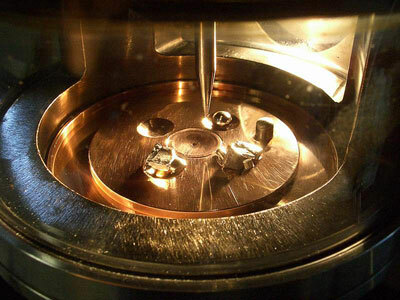 The speed of the cooling process prevents the atoms from adopting the crystal structure found in traditional metals. As a result, metallic glasses have an amorphous structure like that of window glass. Thanks to this procedure, the researchers can add much more zinc to the molten magnesium than is possible with conventional alloys. The glassy alloy developed by the ETH researchers Bruno Zberg, Peter Uggo-witzer and Jörg Löffler contains up to 35% zinc and 5% calcium atoms, with the rest made up of magnesium. A crystalline magnesium-zinc alloy can contain a maximum of 2.4% zinc atoms. If the percentage is higher, an undesired crystalline phase precipitates in the magnesium matrix. The magnesium-zinc-calcium glass can be produced in a thickness of up to 5 millimetres. The major advantage of a high percentage of zinc is that it changes the corrosion behaviour of the magnesium fundamentally. In fact, clinical tests with small platelets of the new magnesium-zinc-calcium alloy showed no hydrogen evolution! Thus this new alloy, in the form of a metallic glass, has considerable potential as a non-harmful bone implant material. The research work has been published in the online version of Nature Materials.